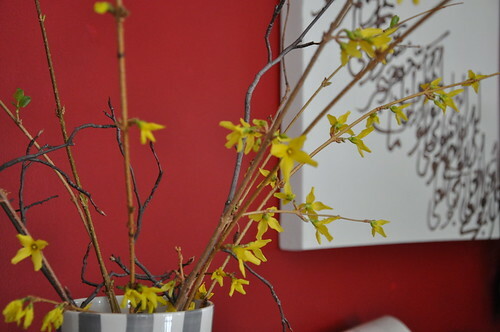 My yearly forced forsythia branches (with a couple of saskatoon branches in there too, though they won’t bloom for a week or two, I don’t think). There are signs of spring out there, already. Except for last week, which was ridiculously snowy, this has been the lamest winter I can remember, so I’m not really ready for it to be over. Having said that, of course, means that I’ve jinxed everything and that we’re going to get another three metres of snow between now and April. Sorry! Busy lately! Work is extra-busy – we’re *this* close to launching the software that I will be supporting, so I’m banking extra time at the office to help with random development tasks (those lieu days in the springtime are going to be SWEET). We’re so close, I can taste it. The job is very good, and I enjoy going, so I’m still glad I made the decision to start working again, though juggling work/home/extra-curriculars has been a bit of a challenge. See that on the right? That is my olympic gold medal. Yes, Olympics time also means Ravelympics time, and this year I decided to join in. The objective is that one picks a project that is a challenge for them to accomplish in the time the Olympics are on, casts on during the opening ceremonies, and must be done by the time the flame is extinguished. For me, it was this pattern. I fell in love with it when I first set eyes on the Winter edition of Knitty, and I had the perfect* yarn for it in my stash (about a sweater’s worth of Berroco Lustra). So I cast on during the Opening Ceremony (Though I didn’t actually watch the ceremony. My cheese tolerance is pretty low. Though it was apparently very good, unlike the Closing Ceremony, which I also didn’t watch, but which was, depending on who I talked to “pretty close to awful”, “mortifying”, and “lame”), and knit like crazy. I finished it around noon last Sunday, in plenty of time to watch The Hockey Game. 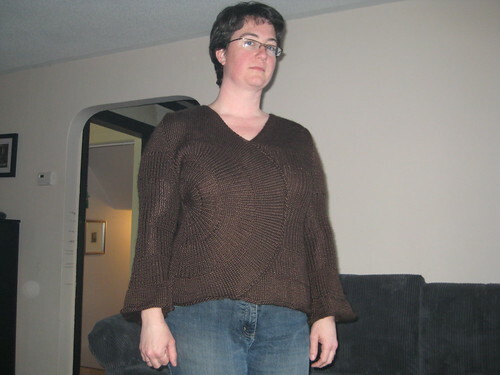 * So, turns out the yarn wasn’t really perfect at all – I looked at the wrong gauge on the pattern and the Lustra turned out to be finer than required, so I did some math and made the sweater two sizes larger than what I needed. I thought, in the middle of knitting it, that it would be way too small, and was mentally trying to figure out who I could give it to, but I blocked it, and lo, it fits! It’s great, because since it’s ribbed pretty much all over, it will fit, even if I lose more weight. Because, yes, I’m on this Plan to lose 5 pounds a month until about August. I started on January 4th, and am currently sitting at 15 lbs (5 lbs ahead of schedule!). I’m tired of looking like a sausage in my pants. I’m signed up to run a 5k in the middle of April, and have been running regularly at the track to train for that, which is helping. I still basically eat the same stuff, only less of it: no more seconds at meals (thus also eliminating thirds, and, on particularly yummy dinner days, fourths…), no more snacks, and only occasional desserts. And things should get even better because now that it’s a little warmer out, I’m going to be running outside, which is good because running at the track is soul-destroyingly boring. I even find now that I crave the runs, which, if you know me is surprising, because I’ve never really been a fan. I still don’t particularly like the during part where I’m actually running, but I love the way I feel for the few hours immediately after the run. It’s strangely addictive. Almost done my Back to School vest (just down to tucking in the ends). Nothing much more to say about that except that I really like it. I’ll take pictures and hopefully post them sometime before May. 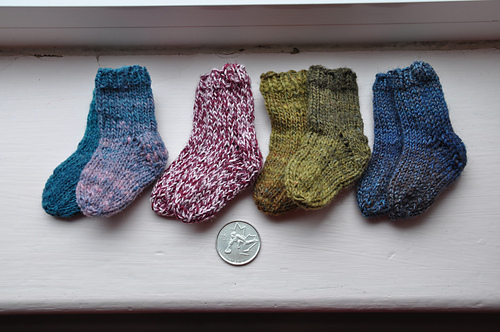 I’ve been working on wee little socks for a friend of mine who’s getting married in April, and decided to make teeny sock keychains as wedding favours for her guests. And then realized that with 130 guests on the invitee list, she had perhaps bitten off more than she could chew. They are ridiculously fun to make, so I’m going to make a pile of pairs. I have 4 pairs done, plus one on the needles so far, and am happy to be using up all these scraps of yarn from the stash. That’s a dime for scale. In the purse, the endless Noro entrelac socks (never again with the Noro, I tell you!). I have one sock done, and everything but the last half row of squares and the cuff. And because I’m apparently unable to learn from past mistakes, and didn’t take any notes on the first sock (“I’ll remember”), the handling of that last row of squares merging into the ribbing for the cuff will probably be nothing like the first sock. Made a crochet jumper for Spinrite, and for some reason took zero pictures. 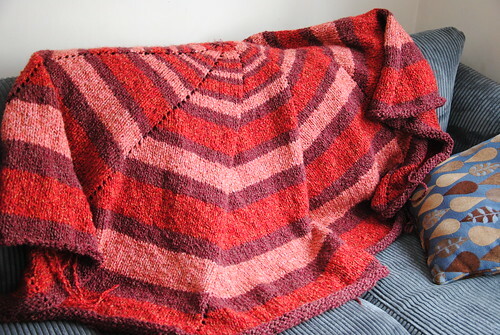 And I finished the circular afghan for Spinrite that I mentioned in my last post. I liked it, in the end, but I still don’t understand why it needed to be round. Next up – plan the garden! I can’t believe it’s March already!